Situato sulla Cooperstown Beverage Trail, Farview Acres offre un ambiente privato con vista panoramica sulla Valle del Butternut. La nostra casa dispone di 3 camere da letto e 1. 5 bagni, cucina completamente attrezzata, camino, stanza bonus nel seminterrato, grill a gas e tavolo da picnic. Dal ponte belvedere coperto godere di una vista mozzafiato e la fauna selvatica. Raccogliere mirtilli nel mese di agosto proprio sulla proprietà o visitare il corso Brewery e golf in città. A soli 18 miglia da entrambi Sogni Park e All Star Village, un giro in paese breve al nuoto a Gilbert Lake State Park o Cooperstown dove si può visitare la Sala di baseball di fama, Fenimore Arte e Musei di Farmer, fare un giro in barca sul bellissimo lago di Otsego o semplicemente passeggiare per la città per eccellenza americano. House immaculate, comfortable and has everything you might need. Owners are very pleasant and easy to work with. 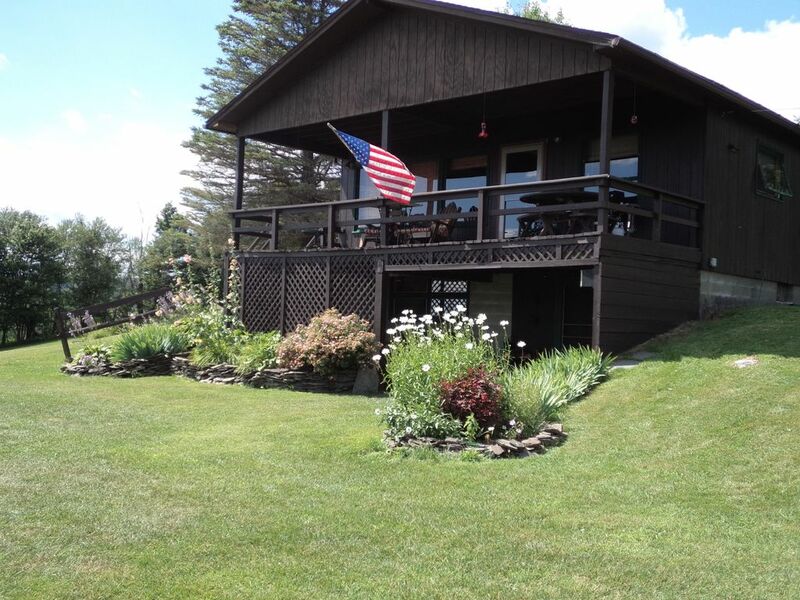 The property and views of Catskills are breathtaking ! Couldn't ask for better. Very convenient to Oneonta and Cooperstown. If you ate looking for a slice of heaven, this would be it ! This 3-bedroom / 2 bath home located in the hills with a beautiful, breath-taking view is a peaceful, serene getaway. The owners do all the right things - the house is stocked with a full kitchen and clean linens as expected/desired, but what I loved is that there are puzzles, videos, games, and decks of cards to keep the family entertained when downtime is to be had (as well as a beautiful flat screen TV with all the channels). As many do, we stayed while my son played baseball in Cooperstown. The drive was about 25 minutes, and arriving at the home was always a pleasant departure from the hustle and bustle of the ballpark. And despite my original concerns, the Wi-Fi and the cellular worked just fine. The owners are very accommodating and easy to communicate with, and always responded in a timely manner. A perfect place for our family of 6 to enjoy a quiet get-away from the excitement of playing baseball in Cooperstown. The incredible view from the front porch was our favorite part of the stay. The property is in great condition with everything we could need in a home away from home. The owners ensured everything went smoothly and were a pleasure to work with. We can’t wait to come back in the future! It was very pleasant and rustic. The driveway was a bit of a surprise--be prepared for a rock road to reach the house--but easy enough once you got going. I wish there was a washer and dryer, but other than that, the amenities were comfortable and we had everything we needed to be able to enjoy dinner out on the spacious deck. It's about 25 minutes to Cooperstown Dreams Park. The owners were easy to get in touch with and made us feel very welcome! The hosts were very nice and responsive to questions and hospitable. The home had everything we needed except a washer and dryer which was something we overlooked when booking, as we did need one and had to to find a laundromat. The home has spectacular views both from the house itself and the drive to get to the house. Although it’s ptoximity to Cooperstown Dream Park was a little harder to get to than we thought it would be, the view made it worth it! Beautiful setting, nice clean home. The hosts were friendly and responsive via email. The house is clean and provides all of the home away from home amenities. The grounds and view are simply gorgeous. I imagine the fall colors would be breathtaking. Check the weather before arriving as I imagine the driveway might be challenging during rain. And if you are staying for Dreams Park, try the 'shortcut' route during the day first as some of the backroad signs are easy to miss.